This condition exists if the engine has not been rotated while the distributor was removed. Lubricate a new housing seal with oil and install on the distributor. 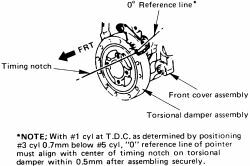 With the rotor aligned with the mark on the housing, install the distributor, taking care to align the distributor body mark with the mark scribed on the engine. 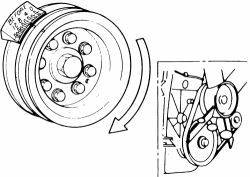 It may be necessary to lift the distributor and turn the rotor slightly to properly align the gears and the oil pump driveshaft. With the respective marks aligned, install the hold-down clamp and bolt finger-tight. If equipped, connect the vacuum hose to the distributor vacuum advance module. Install and secure the distributor cap to the distributor body. Attach the electrical harness(es) to the distributor or coil, depending on engine and coil location. If removed, connect the spark plug and coil wires. If removed, install the air cleaner and hoses. Connect the negative battery cable. Connect a timing light to the engine (following the manufacturer's instructions), then start the engine and check the timing. Adjust, as necessary. Turn the engine OFF and tighten the distributor clamp bolt. Start the engine and recheck the timing. This condition exists when the engine has been rotated with the distributor removed. Rotate the crankshaft to position the No. 1 piston at Top Dead Center (TDC) of the compression stroke. This may be determined by removing the No. 1 spark plug and inserting a rag into the No. 1 spark plug hole, then slowly turning the engine crankshaft. 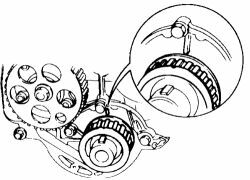 When the timing mark on the crankshaft pulley aligns with the 0° mark on the timing scale and the rag is blown out by the compression, the No. 1 piston is close to TDC. If you are unsure when TDC is reached, remove the valve cover and watch the rocker arms for the No. 1 cylinder. If the valves move as the crankshaft timing marker approaches the scale, the No. 1 piston is on its exhaust stroke. If the valves remain closed as the timing mark approaches the scale, then the No. 1 piston is approaching TDC of the compression stroke. Turn the rotor so that it will point to the No. 1 terminal of the distributor cap. Install the distributor into the engine block. It may be necessary to turn the rotor to engage the distributor and oil pump drive gears. Rotate the engine two revolutions and bring the No. 1 piston to TDC again, then check to see that the rotor is pointing toward the No. 1 terminal of the cap. With the marks aligned, install the hold-down clamp and bolt finger-tight. Install and secure the distributor cap. Attach the electrical harness(es) to the distributor and, if equipped, the vacuum advance hose. If removed, be sure to install the air cleaner and hoses. Connect a timing light to the engine (following the manufacturer's instructions). Start the engine, then check and adjust the timing, as necessary. Start the engine and recheck the timing to verify that it did not change while tightening the hold-down bolt, then stop the engine and remove the timing light. Hi, when I do what u said, the engine cant rotate, I am being careful. and turning by hand, I dont think we got the same engine here. lw3 engine - 2.3L gasoline engine, correct? ok, those are the directions then. are you sure you have the crankshaft set on the compression stroke and not the exhaust stroke? I understand what u r sayiny, I'll have to look for it, I going try something, get back to u later. ok, here is easiest way to ensure you have it on the compression stroke. remove the #1 spark plug, stick a wad of paper in the spark plug tube and then turn the crankshaft by hand until the paper blows out. you now have it at the top dead center on compression stroke. 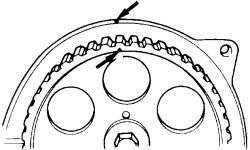 now set your cam according to the diagram and install the distributor using the engine disturbed instructions. ok, I will need to opt out then as that is all the information I have on it. 1994 Isuzu Bighorn 3.1 diesel. We have replaced the water pump.